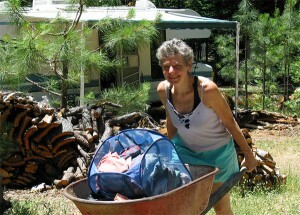 I piled the laundry basket into the wheelbarrow and headed towards the Lone Bobcat Woods house. We’d agreed with our renter to share the washing machine. As I pushed the ‘barrow about a quarter mile to the house in the warm sun, I thought of John Michael Greer’s recent blog Collapse Now and Avoid the Rush. He lays out why collapse is happening and what individuals and communities can do now when more options are available than further down the road. Robyn and I call it “collapse practice.” If we choose to change, even with a spirit of playfulness or adventure, it’s a whole lot easier than when we’re backed into a corner. Here are some collapse practice ideas off the top of my head, not in any particular order. Less is more, starting with expectations. The myth of progress is now curtains. It seemed to work while we had abundant fossil fuels borrowed from the future. The future is now and the debt is coming due. The post-progress myth is still being shaped, but I think we’ll see deeper prosperity than mere stuff can provide. Every point of simplification can be a source of joy. A smaller house or apartment is faster to keep clean and maintain. Less stuff means fewer items to fix when they break, and less guilt when you throw them away (and of course giving them away is another source of joy and lightness). Exception: you may want to have a boneyard — reusable stuff for construction, repairs and projects. If over time you don’t end up using those glass windows for your cold frames, you can pass ’em along to somebody else. Share: you may want access rather than ownership. Sharing a washing machine with hundreds of other people at a laundromat, or with a few neighbors (as I’m doing in the photo), beats owning one. Sharing rides, or a car, is a major energy and money-saver, especially for city dwellers. Roll downhill on the technology/complexity continuum. An outdoor clothesline doesn’t need fixing or take energy like a dryer. A motorcycle for commuting takes a lot less than an SUV. For dependencies, create contingencies. If your water comes from the city, store some for when the power goes out. Ditto for backup lighting and real-live cash, and canned/packaged foods. It’s also about resilience — being able to weather a disruption pretty well. Cultivate flexibility and options. Getting out of debt frees up money to do what you want or need: it’s probably the most important collapse practice of all. A mobile small house plus a network of friends means you can readily move if a better employment opportunity appears elsewhere. Build your skill set and tool set. This is DIY time. Learning to sew means you don’t need somebody else to repair your clothes or make insulated curtains to (this from the work jeans patch queen). Likewise for simple plumbing, construction, electrical, herbal medicinals, first aid, engine mechanics, and good interpersonal communication skills. DIY doesn’t mean you learn ALL of these: start with what interests you, and broaden your skills as opportunities appear. Join hands. Humans are tribal creatures. Despite our culture’s bias for hyper-individualism, nobody’s gonna make it through the rough patches alone. Find the people you can work with. It may be neighbors for emergency preparedness, other gardeners at the community garden, members at your church or social group. Develop your skills so you become valued by your community, and have them as “currency” for exchanges. As you simplify and build resilience, you can celebrate fewer worries, shorter to-do lists, and better sleep. You’re increasing security in a different way than our materialist culture promotes: you’re moving it from stuff to people, starting with yourself. A deeper security, a deeper prosperity. This is a down-to-earth laundry list of getting it done. I will be quoting you and we’ll post a link our our website. Thank you so much for putting this out in such succinct and user-friendly form! A damned good journal entry. I am not yet at your level of collapse resilience, but certainly getting close. Another basic thing we require is soap. It is so easy to make, and at less than 25% of the cost of commercial soap. I started making soap back in January and haven’t bought hand, dishwashing, clothes washing soap or shampoo since. All you need is a supply of fat or oil. If you can’t get caustic soda (NaOH) then you can make lye (KOH) from the white ash left over from a wood fire. There are simple recipes available on the Internet, so the information is easy to get. Home made soap is superior to commercial as the commercial soap has the glycerine (a byproduct of the saponification process) removed, making it harder and less kind to the skin. I also find that it suds up better. Just add some rolled oats or sago as an abrasive, some nice smelling essential oil and you have the ideal soap for showering with. Plain soap can be grated and used as a washing soap when mixed with washing soda. Shampoo can be madeby heating grated soap with water and a small amount of glycerine. The home made soap nearly has enough glycerine in it already. Don’t forget something that smells nice. For instance, you can boil up rosemary and lemon peel in the water to give the shampoo a pleasing scent. Have a go at it, I think you’ll love the process.